People’s Power Assemblies (PPA) organizes to empower workers and oppressed people to demand jobs, education & healthcare while fighting against racist police terror, sexism, LGBTQ and ableist oppression. We are ALL Michael Brown! STAND WITH THE FERGUSON COMMUNITY! 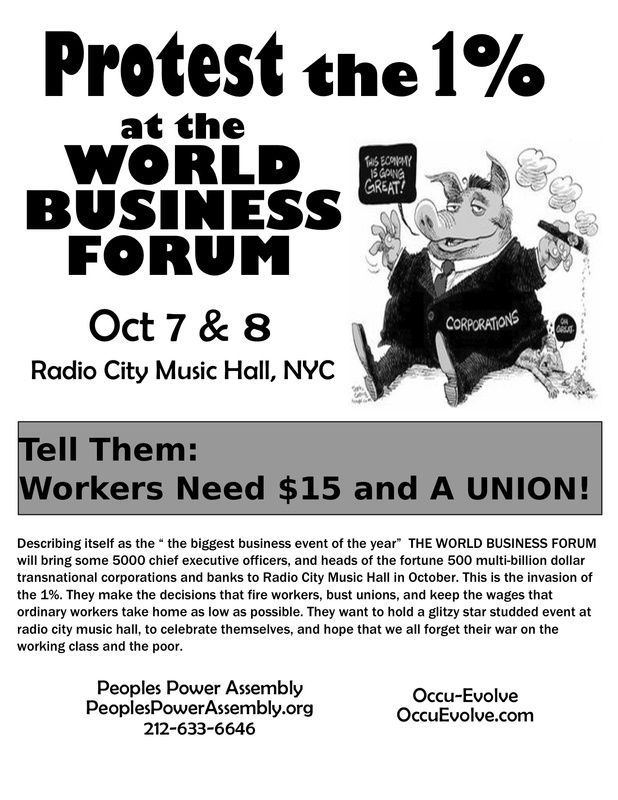 Describing itself as the “the biggest business event of the year” THE WORLD BUSINESS FORUM will bring some 5000 chief executive officers, and heads of the fortune 500 multi-billion dollar transnational corporations and banks to Radio City Music Hall in October. This is the invasion of the 1%. They make the decisions that fire workers, bust unions, and keep the wages that ordinary workers take home as low as possible. 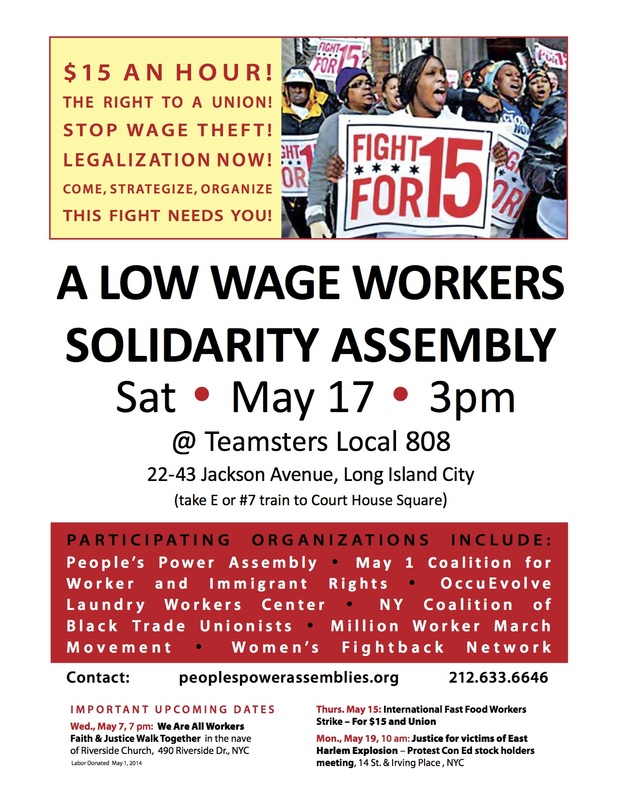 We will be there to say “No Way: Workers Need $15 & a union.” Call 212-633-6646 or FaceBook. Citywide Los Angeles Workers Assembly! Follow up Organizers Meeting August 9 – 3 PM. More info. Speak out & testify: Can you survive on your pay? Missing hours in your pay check? Working part time & want full time? Facing racism on the job or harassed because you are a woman or LGBTQ or because of immigrant status? Join us to July 19, 2014. Something new happened on the planet May 15, 2014. 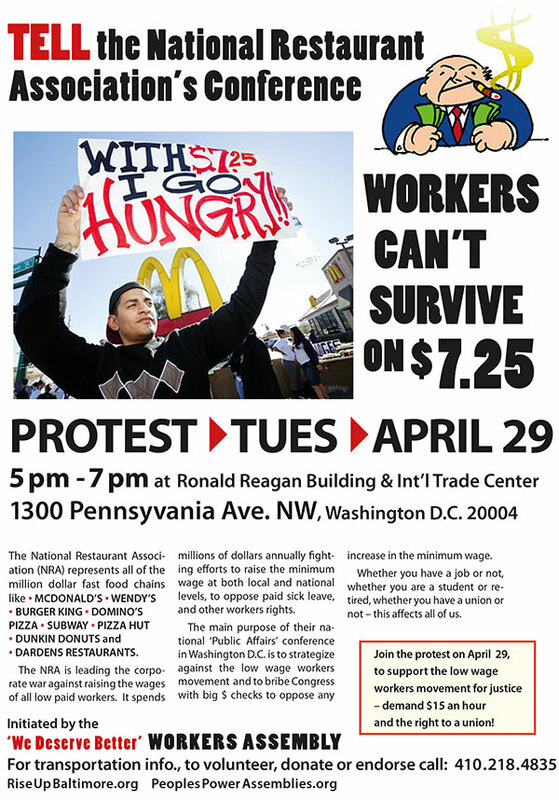 Low-wage workers in the fast food industry and their supporters went on strike and took part in protests in over 150 US cities, including 56 where there had been no previous actions recently, and internationally in 93 cities in 36 countries. READ MORE from all around the USA. Build the global struggle for $15 an hour. Build Peoples’ Power! -May 19: Justice for Victims of East Harlem Explosion – Protest at Con Ed Stockholders meeting. Leaflets & info. Por espanol/more details. 212-633-6646. FaceBook. May 15 workers in more than 150 US cities & 33 countries will hold the first & largest in history global strike/protest for a living wage & the right to unionize. This affects us all! Post on FaceBook what your city or town is doing. Take pictures. Make the movement grow! 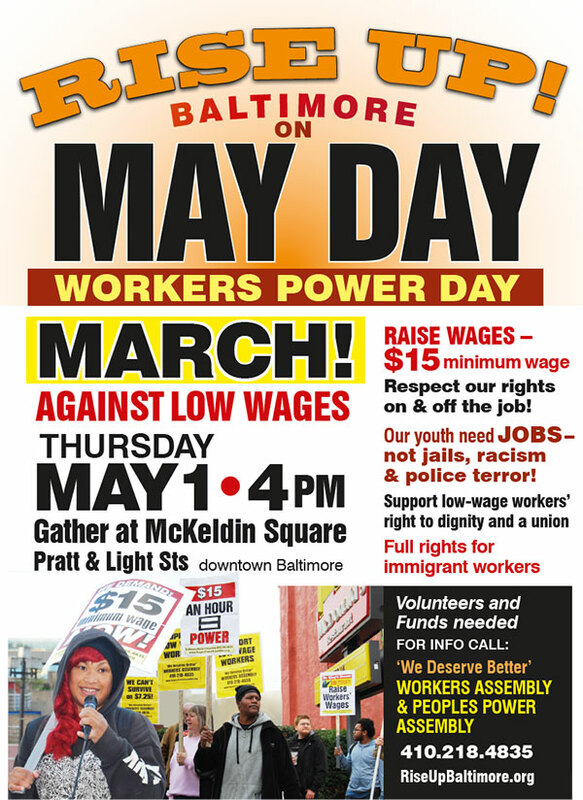 For specifics, including Contact info, call 410-218-4835 or see: FaceBook Event; RiseUpBaltimore.org. Victory for Boston School Bus Drivers! Lessons for all workers! WISC BailOutPeople: Join the struggle! We WON: No Post Office in Staples!